GAO Released this report: Foreign Asset Reporting, Actions Needed to Enhance Compliance Efforts, Eliminate Overlapping Requirements, and Mitigate Burdens on U.S. Persons Abroad (GAO-19-180 April 2019), here. Data quality and management issues have limited the effectiveness of the Internal Revenue Service’s (IRS) efforts to improve taxpayer compliance using foreign financial asset data collected under the Foreign Account Tax Compliance Act (FATCA). Specifically, IRS has had difficulties matching the information reported by foreign financial institutions (FFI) with U.S. taxpayers’ tax filings due to missing or inaccurate Taxpayer Identification Numbers provided by FFIs. Further, IRS lacks access to consistent and complete data on foreign financial assets and other data reported in tax filings by U.S. persons, in part, because some IRS databases do not store foreign asset data reported from paper filings. IRS has also stopped pursuing a comprehensive plan to leverage FATCA data to improve taxpayer compliance because, according to IRS officials, IRS moved away from updating broad strategy documents to focus on individual compliance campaigns. Ensuring access to consistent and complete data collected from U.S. persons—and employing a plan to leverage such data—would help IRS better leverage such campaigns and increase taxpayer compliance. According to documents GAO reviewed, and focus groups and interviews GAO conducted, FFIs closed some U.S. persons’ existing accounts or denied them opportunities to open new accounts after FATCA was enacted due to increased costs, and risks they pose under FATCA reporting requirements. According to Department of State (State) data, annual approvals of renunciations of U.S. citizenship increased from 1,601 to 4,449—or nearly 178 percent—from 2011 through 2016, attributable in part to the difficulties cited above. The United States has many international agreements that require treaty partners to provide certain information to IRS, which can help prevent the use of foreign bank accounts to facilitate tax evasion. FATCA goes much further, requiring FFIs to report more detailed information to IRS about their U.S. customers annually. These provisions are important developments in efforts to combat tax evasion by U.S. persons holding investments in offshore accounts. FATCA generally requires certain taxpayers to report foreign financial accounts and other specified foreign financial assets whose aggregate value exceeds specified thresholds to IRS on Form 8938.n10 These taxpayers must report these assets and income generated from such assets to IRS with their tax return on Form 8938. These thresholds vary by filing status—such as single or married filing jointly—and by domestic or foreign residency. n10 26 U.S.C. § 6038D; 26 C.F.R. § 1.6038D-2. Taxpayers required to report specified foreign financial assets to IRS under IRC section 6038D include U.S. citizens, U.S. resident aliens (even if resident for only part of the year), nonresident aliens who elect to be treated as resident aliens for purposes of filing a joint tax return, and nonresident aliens who are bona fide residents of Puerto Rico, Guam, American Samoa, the Northern Mariana Islands, or the U.S. Virgin Islands. 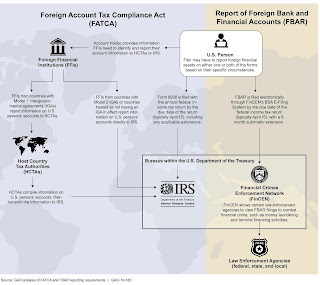 FATCA also promotes third-party reporting of foreign financial assets by requiring a withholding agent to withhold 30 percent on certain payments to an FFI unless the FFI or the jurisdiction in which the FFI is located has entered into an agreement with the United States to report certain account information of their U.S. customers. n12 Under such an agreement, participating FFIs report detailed information to IRS annually about accounts held by their U.S. customers using an IRS Form 8966, FATCA Report (Form 8966). n13 According to IRS, FATCA improves visibility into taxable income from foreign sources, and enhances the agency’s ability to identify and pursue taxpayer noncompliance. For example, FATCA allows IRS to compare information reported by FFIs on Forms 8966 to information reported by U.S. persons on Forms 8938. According to IRS, this comparison can be used to ensure taxpayers and FFIs are properly reporting foreign financial assets and income from international investments. This type of comparison is a common IRS enforcement technique. For example, IRS can directly compare information it receives from financial institutions’ IRS Form 1099-INT, Interest Income, against a tax return to determine if the taxpayer reported income generated from interest earned. n12 26 U.S.C. 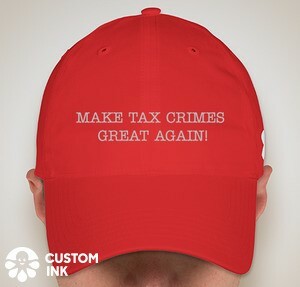 §§ 1471-1474.
n13 In general, information participating FFIs are required to report on the Form 8966 includes the name, address, and TIN of accountholders who are specified U.S. persons; and the account number, balance or value, gross receipts, and gross withdrawals or payments from each account held by such persons. To facilitate FATCA implementation for FFIs operating in jurisdictions with laws that would prohibit FFIs from complying with the terms of the FFI agreement, Treasury developed two alternative intergovernmental agreements (IGA)—Model 1 and Model 2—to facilitate the effective and efficient implementation of FATCA by removing partner jurisdictions’ legal impediments to comply with FATCA reporting requirements, and reducing burdens on FFIs located in partner jurisdictions. FFIs from countries with Model 1 IGAs report information on U.S. persons’ accounts to their respective host country tax authorities (HCTAs). The HCTAs, in turn, compile the information from FFIs and transmit it to IRS. In contrast, FFIs from countries with Model 2 IGAs, or countries treated as not having an IGA in effect, directly report information on U.S. persons’ accounts to IRS. Separate from the FATCA requirements, regulations implementing the Bank Secrecy Act of 1970 (BSA) also impose a separate self-reporting requirement for foreign accounts. n14 Specifically, certain taxpayers and residents are required to file an FBAR with FinCEN annually if they have financial interest or signature or other authority over one or more foreign financial accounts with a total of more than $10,000, regardless of whether they reside within or outside the United States. Federal, state, and local law enforcement agencies can use information from these reports to combat financial crimes, including terrorist financing and tax evasion. Appendix IV provides a comparison of Form 8938 and FBAR reporting requirements. Two reporting systems for sharing foreign account information from foreign financial institutions are in operation globally—FATCA and the Common Reporting Standard (CRS). 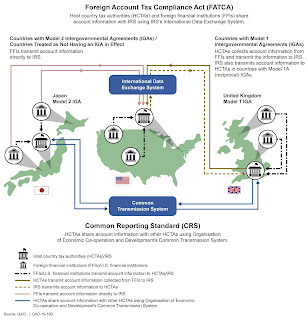 According to officials from banking associations and a consulting firm, FFIs in the countries where we examined FATCA implementation encountered challenges implementing and now maintaining two overlapping reporting systems for collecting and transmitting account information to other countries for a seemingly similar purpose, and collecting sufficient information from customers to ensure they meet the requirements of both systems. As noted above, we previously identified overlap as occurring when multiple agencies or programs have similar goals, engage in similar activities or strategies to achieve them, or target similar beneficiaries. 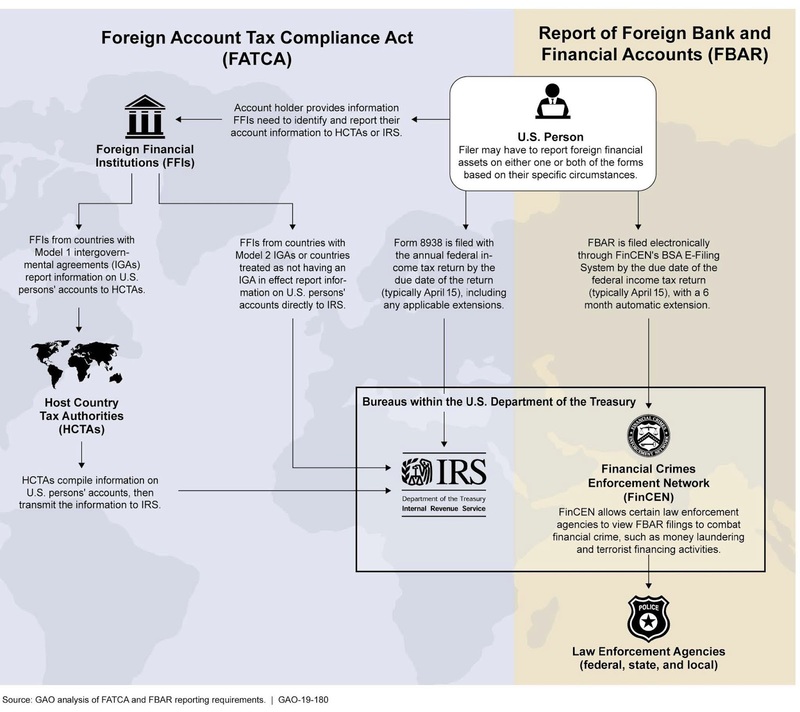 According to an IRS official, collecting account information under FATCA ushered in an era of greater transparency; as noted above, FATCA’s passage sought to reduce tax evasion by creating greater transparency and accountability with respect to offshore accounts and other assets held by U.S. taxpayers. When FATCA was first introduced, there was no international platform to share account information between countries. The United States and other countries worked together to reach an agreement on the electronic formatting that would be used to share the information. Other countries tax authorities’ became more interested in understanding the financial assets held abroad by their residents through an exchange of account information among themselves. In response, the Organisation for Economic Co-operation and Development (OECD) established the CRS reporting system for automatic exchange of information among member countries. According to the OECD, CRS was developed with a view to maximize efficiency and reduce cost for financial institutions. Thus, CRS drew extensively on the intergovernmental approach used to implement FATCA reporting requirements for FFIs. 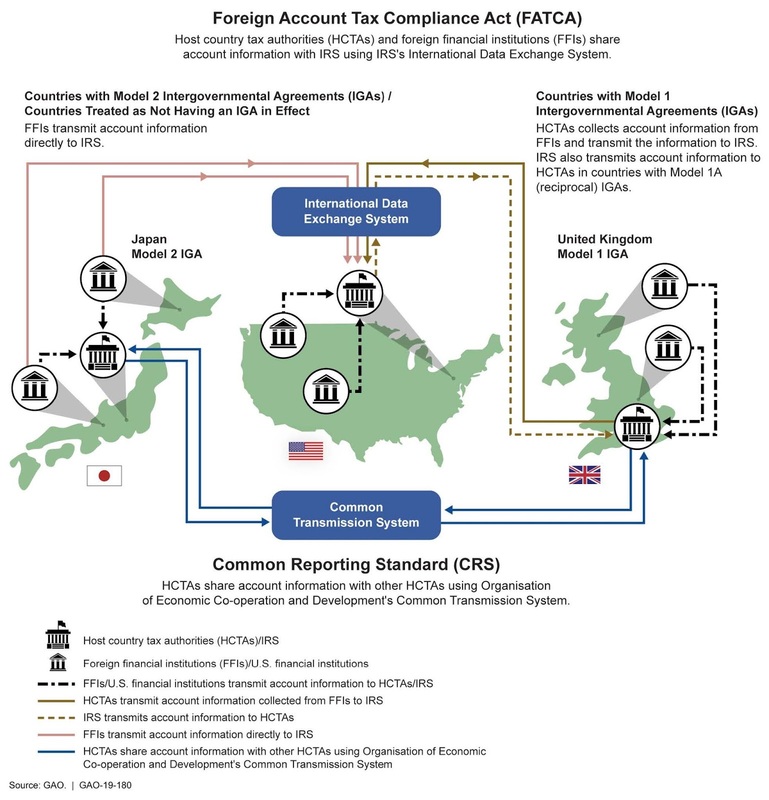 Countries participating in CRS exchange account information with each other using OECD’s Common Transmission System, which was modeled on FATCA’s International Data Exchange System. CRS reporting requirements are in many ways similar to FATCA, including required reporting of the account holders’ name and address, taxpayer identification number, account number, account balance, and income and sales proceeds. However, the requirements differ in significant ways. The biggest differences in requirements are driven by the nature of the U.S. tax system. The United States, like many countries, generally taxes citizens and resident aliens on their worldwide income regardless of where that income is earned. However, the United States differs from other countries because it generally subjects U.S. citizens who reside abroad to U.S. taxation in the same manner as U.S. residents. In contrast to U.S. policy, most other countries do not tax their citizens if they reside in a country other than their country of citizenship. Further, IGAs implementing FATCA require FFIs to report the foreign-held accounts of U.S. citizens and residents—including resident aliens—while CRS requires financial institutions in jurisdictions participating in CRS to report on almost all accounts held by nonresidents of the reporting country. Appendix V provides more detailed information on differences in reporting requirements, due diligence requirements, and definitions under FATCA and CRS. These differences in tax systems drive variations in due diligence procedures between FATCA and CRS. For example, FATCA aims to identify whether an account holder at a foreign institution is a U.S. person based on citizenship and tax residency information.52 In contrast, CRS aims to identify the tax residency of all account holders of a financial institution, and does not consider citizenship. Due to the multilateral nature of CRS, if an account holder is determined on the basis of the due diligence procedures to have residency in two or more countries, information would be exchanged with all jurisdictions in which the account holder is determined a resident for tax purposes. Under CRS rules, information about foreign accounts held by a U.S. citizen with a tax residence abroad would not be reported to IRS, but rather to the jurisdiction in which they were a resident for tax purposes. Because the United States taxes the worldwide income of U.S. citizens, CRS rules would need to require identification of account holders’ citizenship in member countries where they are residents if FATCA were to be aligned with CRS. • require financial institutions to report information with respect to financial accounts held by certain passive entities with substantial foreign owners. While better aligning FATCA and CRS to some extent is possible, anything short of the United States fully adopting CRS would not fully eliminate the burdens of overlapping requirements that FFIs must currently meet under the two different systems. While having the United States adopt the CRS reporting system in lieu of FATCA could benefit FFIs that may otherwise have to operate two overlapping reporting systems, it would result in no additional benefit to IRS in terms of obtaining information on U.S. accounts. Additionally, it could generate additional costs and reporting burdens to U.S. financial institutions that would need to implement systems to meet CRS requirements. The extent of these costs is unknown. Further, adoption of CRS would create the circumstance where foreign accounts held by U.S. citizens with a tax residence in partner jurisdiction—including U.S. citizens who have a U.S. tax obligation—would not be reported to IRS.